A cross-post from the LAMP blog I also run: LAMP mentored ‘Social Media, Multi-Platform’ Drama Scorched won the coveted International Interactive Emmy Award from the Academy of Television Arts & Sciences last night at MIP TV. The first time Australia has won this award. A big congratulations particularly to producers Marcus Gillezeau and Ellenor Cox from Firelight Productions. These awards are held annually at MIP TV in Cannes and celebrate the most innovative drama, documentary, informational and entertainment services delivered on multiple platforms. Through these awards, the International Academy of Television Arts & Sciences is celebrating a significantly growing sector of the television industry and recognize excellence in content created and designed for viewer interaction and/or delivery on a digital platform. Brian Seth Hurst (Second Vice Chair at Academy of Television Arts & Sciences and CEO at The Opportunity Management Company) who helps organise these awards sent through this Twitpic of himself (mid left), Chris Hilton from Essential Media and Entertainment (far left), Marcus Gillezeau (mid right) and Mike Cowap (Innovation Head at Screen Australia – far right), at the after awards (30 minutes ago!). Picture from Brian Seth Hurst (actual photographer as yet unknown). The International Academy of Television Arts & Sciences revealed the winners for the International Digital Emmy Awards at the MIP TV opening festivities in Cannes, France. The non-fiction category went to “Britain From Above,” while “Battlefront” won the children and young people category. Both programs were from the U.K.
Scorched has received a great deal of attention and commentary from press and also those closer to the project. This is the LAMP post about the launch, here is Guy Gadney at MIPTV at the moment (then head of PBL New Media, Channel 9) and Gary Hayes (LAMP Director’s personal media blog). It is great news that another LAMP connected project has won the International Emmy’s – examples of earlier ones included Jim Shomos (LAMP mentor) with his Forget the Rules projects, the winner of the Ogilvy Amex award by then LAMP mentor Jackie Turner and other LAMP projects such as The Deep Sleep won development awards too. Previous iiEmmy award winners in related categories have included Canadian Xenophile’s Alternate Reality Doco/Drama Regenesis and Total Drama Island plus fellow Canadian’s Zinc Roe with their Zimmer Twins service (now featured globally). Link to the Canadian’s winning most awards two years ago here and the image below is of the two teams during the awards taken by Gary Hayes. There are a multitude of sites out there asking the ‘audience’ (grrr) to submit films, music, scripts, stories, bits of their personal life and anything the brand or property feel will draw them into their branded world. Many go about it in a really poor way, providing virtually no incentive, a pretty small audience (as regards the actual community that will likely see their work) and often give little or no encouragement to learn and improve on their original submission. Many even resort to seeding the ‘competition’ with faux community created videos (made by pros deliberately shaking the camera!) – to pretend to kick-start it – they have no idea how easy it is for the community to sniff that out. An easier and more enpowering way in for the co-creative community is to give them ‘great’ assets to create great content – it gives them a big kick-start. Giving them the same stuff that the pros get generates the real big incentive – it lets them show how ‘they’ are as good, if not better, than the pros! It also shows a willingness on the part of the usually out of reach ‘creative production’ to expose some of the real behind the scenes’ness and draw communities into the brand firstly from a ‘trust’ perspective. Secondly as the ‘creative audience’ members themselves will be spending many hours with the assets and this creates very strong brand/story loyalty. Often these creative types are pretty active influencers on the web anyhow and will draw their own communities into the brand. The list of benefits goes on. Below are relatively recent examples of professional film and music folk throwing top draw fragments of content (rushes, isolated tracks etc) over the wall for the wannabee’s to work their own magic. I have written about this subject a few times in the past but Bronwen Clune on Twitter pointed out her brainchild initiative, a Disney / AFTRS Film “Two Fists One Heart” making available some rushes for the community to re-edit. Cutscene site has all the information on the project and a mention should go out to my colleague at AFTRS, Bill Russo who has the enviable task (yes enviable as it is a joy to see community wisdom like this) of viewing potentially hundreds (see examples below) of alternately edited scenes. The best 5 scenes will be posted on Disney€™s promotional TWO FISTS ONE HEART site. This is a great opportunity for some exposure to high-profile people in the film industry. The 5 best scene cuts will be selected by Bill Russo head of Editing at the AFTRS and the creative team from TWO FISTS ONE HEART. TWO FISTS ONE HEART Director Shawn Seet, Editor Milena Romanin and Cinematogropher Hugh Miller are all graduates from AFTRS, Australia€™s premiere Film and Television school. Of course this is not a new idea and I recall at least five major projects at the BBC I was involved in from 96-03 that did a call out based on downloading and then re-editing, ‘professional’ footage (and at least 20 other ‘mash-ups’ using web interfaces). A recent non-BBC, feature example (Jan 08) that springs to mind is Tracey Fragments – a sort of timecode’esque Canadian film that gave away the ‘whole’ film to re-edit and again used YouTube to show the re-fragmentation. These are still available on the site – click refragmented. Here’s one example of a re-edit that have around 10 000 views each on YouTube. Tracey: Re-Fragmented made available all the footage from the shoot of the film for users to download and re-edit their own replated projects including music videos, new trailers or to re-redit the entire movie themselves. A contest for best use of the footage has just closed at the end of January and judging will commence soon. The re-reditng initiative also has a competititve elements with Bruce McDonald and his editors selecting the best from the pojects from Canadaa to win an Apple Final Cut Pro prize pack. The winning project will also appear in the bonus features on the DVD release of The Tracey Fragments. To highlight the creative potential of the Open Earth Archive the BBC is also running a competition to make a short ‘advert’ for Planet Earth. Novice editors can enter the competition through the Easy Edit Suite, an exclusive application available free on the Open Earth Archive site allowing users to create a short video with a sound track using some of the best bits of the archive. The competition closes on 30 April 2006 and winners will spend time in an edit suite with experts seeing how the professionals edit for BBC Television. The Open Earth Archive is made freely available for the UK public to use under the terms of the Creative Archive Licence. The Creative Archive Licence allows people within the UK to watch, download and edit material released for non-commercial purposes, using it to inspire and create their own creative endeavours. At LAMP there have been at least 20 projects based on the call for creative contribution. This includes the iEmmy nominee Scorched as well as a Gruen Transfer’esque ‘Sold in 60 Seconds‘ and most of our ARG variants. 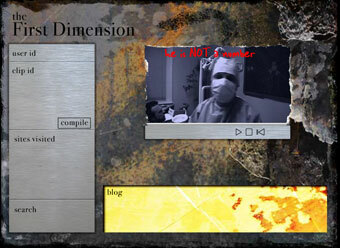 One really cool ‘video fragment’ example was on our very first residential workshop lab in late 2005, Insect Men. Insect Men was a video fragment scavenger hunt. The mind of a character (of course represented by a linear film sequence) was shattered in a freak lab accident and his mind spread all over the web, outdoors and on linear channels (these things happen!). The audience had to find, collect them and put it back together in a meaningful way. This predated Eternal Sunshine of the Spotless Mind and other similar recent play’s on fragmented memory but this is less about story and more about bringing a game-play element into the re-cut too. The team were clear that there was no right or wrong way to put this unfortunate characters mind back together but rather courted community compare contrast – which is the best way forward. What to do when all this great stuff comes back?! Looking at exactly the same methodology of – here are some professionally created assets by your heros for you to rebuild in ‘your’ way – Imogen Heap (who I keep going on about?!) in the past month gave away a song in the form of lead and backing vocals for the co-creative fans to provide their own music. This takes it a step further as the backing to the vocal tracks truly represents the genre and style of the contributors vs the more subtle ‘persona’ that comes through a pure film edit. Imogen and team got back nearly 400 completely rebuilt unique 3 minute songs and you can listen to 219 of them here on the Twestival site. They were so overawed by them they are going to release a special EP with the best ones on. Shame that wasn’t part of the original incentive – but it probably didn’t matter in the case of a loyal fan base already! OK there are folk out there who use ProTools, Final Cut, Logic, Cubase etc etc: There are even more who are now familiar with iMovie, MovieMaker, Garageband etc: But although these will produce much better and original results it requires a significant amount of extra effort than a browser based tool. I was a little derogatory about web based editing or mash-up tools earlier but there have been a few good examples over the past 12 years on the web we know today – yes folks they have been around for that long! Even I did some in 1995 when I put the first audio and video on the main BBC sites in the UK – simple quicktime based mixers which worked even in the days of 28k modems! A recent one that works because it is so integrated with the TV component is ABC Australia’s Gruen Transfer. 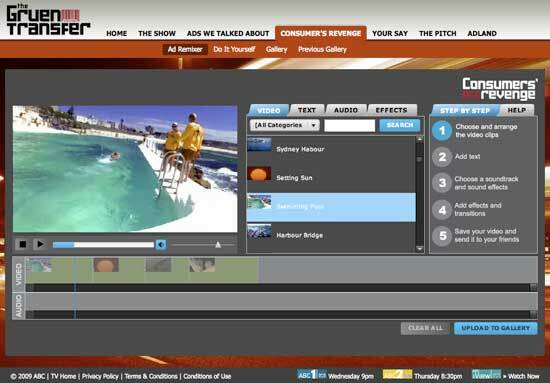 The thing that really works for me (above and beyond the AdMixer interface and usuabilty – yes they are getting better) is the fact the call out from the show gives a very specific task – this week/series for example the presenter said – go and create using a bunch of pre-built clips/audio and text, a promotional advert to sell Australia. Simple, a bit limited tool and clip wise, but really easy for an audience to quickly produce something meaningful with very little effort. and the list goes on especially if we include fan driven or film school based competitions! But a last point I shall leave you with is make it accessible. If only 1-2 % of the audience will get off their a$&#s and make something and send it in then make it easier for them – grow that to 10% or more. I covered the sort of splits of the co-creative audience on my post Web 2.0 and the Myth of Non-Participation. Allow them to search and embed other peoples work, allow them to just vote or rate (obvious and used a lot of course) or give them some really good material so they can create something ‘they’ will be proud of – like most of the examples above here. OK there are lots more examples of this including community driven film sites like my fav triggerstreet and I have probably missed the ‘big’ ones (so tell me in comments!) but the last message – Throw good stuff at your collaborative, co-creative audience and they will reward you many times over! Games & Virtual Worlds are Dying? So What’s The ROI? Dying? 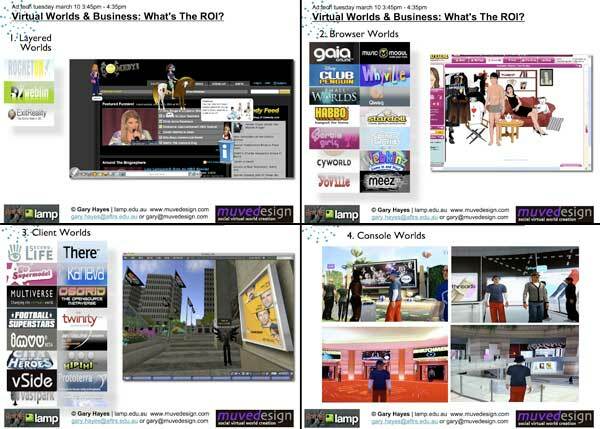 More in the middle of this post – Thought I would share my lil’ introduction slides from ad:tech 2009 earlier this week. It is such a short time (each panel is given 50 minutes) to cover such a vast area and myself, Jeff (habbo.com.au) and Mitch (SmallWorlds.com) were all struggling to impart tons of great info/examples and have enough time to get interactive. I hogged the first 15 minutes by giving a broad overview and some examples I have been involved in that fitted the brief of the talk. Below are my slides,Â a little descriptive text below that and at the bottom of this post some deeper insight into SmallWorlds (given most of my readers probably know Habbo already? – If not, Why Not!? ). I included one slide from Jeff Brookes set looking at Hitwise’s stats on browser worlds and other sites in terms of session length which will raise a few eyebrows! There’s no one in them? & people don’t spend long there? They are for kids or social ‘games’ not business? If there is an economic crisis, then it isn’t impacting any of the startups making virtual goods, online games or virtual worlds. In just the last month alone, three companies have raised mega-millions from venture capitalists. Greystripe, a games-related advertising network, raised another $5.5 million in funding, bringing its total to $15.6 million. We have covered them in the past. SuperSecret, a San Francisco-based online social gaming company, raised $10 million in Series A funding led by Opus Capital. They are targeting the tween market and hoping kids graduate from Club Penguin or Webkinz to their offering. Offerpal, a startup that links virtual currency to real-world marketing deals, raised a whopping $15 million in funding late last month from D.E. Shaw Ventures and others. The investor interest in these startups mirrors the growing popularity of social games and virtual worlds, especially among younger web users.